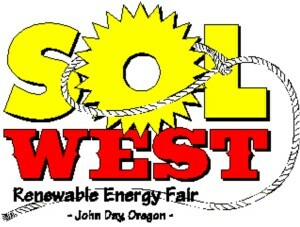 The eleventh annual SolWest Renewable Energy Fair will be held on July 24-26, 2009, at the Grant County Fairgrounds in John Day, OR. Admission includes over 50 free workshops on both off-grid and grid-intertied renewable energy (RE) and sustainable living topics. In-depth pre-fair workshops will cover renewable energy technology and natural building. Fifty exhibitors show tools for energy independence and lifestyle self-reliance, including solar, wind and agricultural resources. Keynote speaker Jeff Mapes, author of “Pedaling Revolution,” will inspire you to view human-powered transportation as a healthy alternative. Thanks for adding this to the directory, Adam! This looks like a great activity for the family and anyone interested in using solar energy and other renewable energy technology for their home.